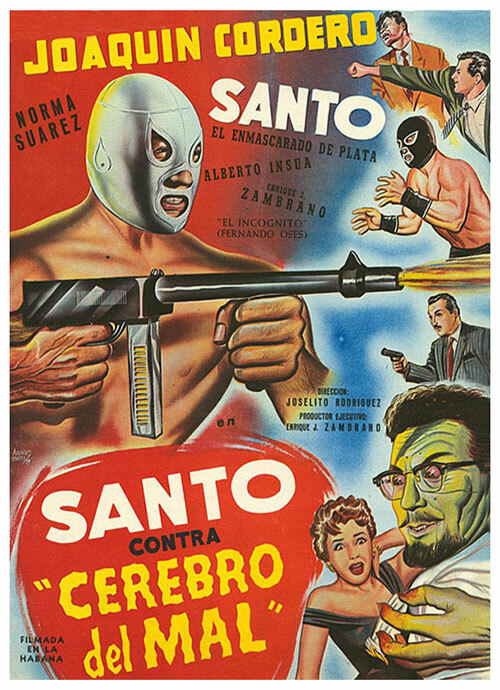 Santo is submitted by a group of thugs and after being mesmerized by the evil Dr. Campos (Joaquin Cordero) is forced to collaborate on this plan, including bank robberies and especially the theft of the formula for the disintegration of the cell that is held by other scientists. It is necessary that the inspector Zambrano (Enrique Zambrano) request the cooperation of another masked, Incognito (Fernando Oses) to prevent Campos sold the formula to a foreign power. This is the first movie by el Santo, filmed in Cuba at the same time as his second film, Hombres Infernales. 3 Response to "Santo vs. the Evil Brain (1961) Joselito Rodríguez"
Thanks for the Santo flicks!! Viva Santo! !